This week we're up to 29 locks, with eight more near-locks, leaving ten bids available for the 25 teams with non-zero chances of earning a spot in the Dance. The first six teams out this week are Arkansas, Florida State, Dayton, Boise State, West Virginia, and St. Joseph's. The last four in are Baylor, Xavier, Minnesota, and St. John's. BYU was moved down to the 12 seed line to accommodate their requirement of not being placed into a bracket where they might have to play on a Sunday. 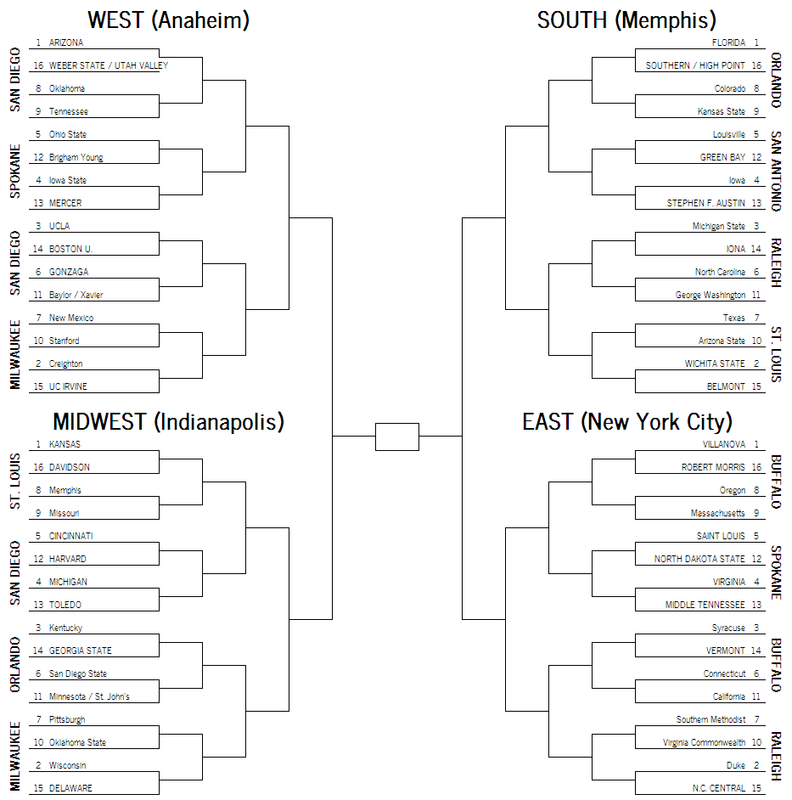 I'm dispensing with the conference-by-conference format from here on out so that I can talk more about each team. Bubble team breakdowns after the jump. SMU (91%) - Losing at Temple over the weekend put the Mustangs in a tougher spot than they'd otherwise be. They'll be fine so long as they win at least two of their four remaining games, but they'll also be underdogs in three of those games. Stanford (90%) - The Cardinal have five tough games remaining--UCLA in Maples tomorrow, a trip to the Arizona schools next weekend, and then Colorado and Utah in Palo Alto to close out the season--but they should be in as long as they can win any two of them. Oklahoma St. (87%) - Three weeks ago, the Cowboys' chances of reaching the Tournament were 99.95%. Seven consecutive losses later, they're still in decent enough shape to make the Dance. Three wins in their next five games will earn them a bid. Baylor (82%) - Baylor's swoon predated Oklahoma State's by three weeks. Three straight wins have the Bears back on the right side of the bubble. Two more wins in the next five games will lock up a bid. Tennessee (82%) - The Volunteers whiffed on their three chances to knock off Tennessee and Kentucky, but they do have wins over Xavier and Virginia. They'll need to win all five remaining regular season games to feel 100% comfortable on Selection Sunday--and they'll be favored by at least five points in all of them--but four wins probably earns a bid. California (75%) - Cal needs to avoid taking a bad loss at USC on Sunday and then win at least two of the remaining four after that. BYU (73%) - The Cougars helped themselves with a win over Gonzaga last night, but they can't lose either of the remaining regular season games, and probably need to reach the WCC finals. Minnesota (70%) - The Gophers were in great shape a few weeks ago after knocking off Ohio State and Wisconsin and taking Michigan State to overtime in East Lansing. Home losses to Northwestern and Illinois have them scrambling now, though. They need to split their last four regular season games to earn a bid, and they'll be big underdogs in three of the four. St. John's (64%) - After starting Big East play 0-5, the Johnnies have won 8 of the last 9 to claw their way back into the Tournament picture. They'll need to win at least 2 of their next 4 games to earn a bid. Xavier (63%) - The Musketeers have five games remaining and they'll be underdogs in all of them. They'll need to win at least 2 of them and show well in the Big East Tournament in order to earn a bid. Arkansas (32%) - The Razorbacks' chances are this high based on a high TAPE rating, but that rating itself is dubious thanks to Arkansas' skewed home-road split. With three road games remaining--including one at Kentucky--the Hogs have the opportunity to earn a bid and reverse their reputation. Dayton (28%) - The Flyers need to win four of their five remaining games and show well at the A-10 Tournament. Florida St. (27%) - The Seminoles have to win 3 of their remaining four games to finish with a .500 conference record. Doing so would also earn a signature victory over Pittsburgh and/or Syracuse. Toledo (26%) - If Toledo wins out in the regular season and then loses in the MAC final, they could be a tough case for the Committee. They'd have a top-30 RPI, but only one game against a team in the RPI top 50 on their schedule--a loss at Kansas. St. Joseph's (23%) - St. Joe's is a big-boy version of Toledo. They're likely to end up with a top-50 RPI ranking, but outside of victories over VCU and UMass, it's a rather hollow ranking. If this year's Committee tends toward weighting the RPI heavily, St. Joe's has a decent enough shot at getting at least sent to Dayton if they can win 4 of their remaining 5 games; if, on the other hand, the Committee doesn't use RPI as much as they like to tell us they don't, the Hawks will be playing in the NIT. Boise St. (20%) - The win over New Mexico last week kept the Broncos' hopes alive, but they realistically have to win at least four of their remaining five games and show well at the MWC Tournament. West Virginia (13%) - The Mountaineers are now projected to finish with 9 or 10 wins in the Big 12. They'll probably need to get to get to 11, plus get a win over a good team in the first round of the conference tournament in order to earn a bid. Southern Miss (12%) - The Golden Eagles are in almost exactly the same situation as Toledo, only their RPI upside is about 10 spots lower than the Rockets'. Richmond (9%) - If the Spiders win five of their next six games (five regular season plus the first round of the A-10 Tournament) they should finish with an RPI in the mid-40s, which ought to be enough to earn a bid. Nebraska (8%) - With wins over Michigan State, Minnesota, and Ohio State, the Cornhuskers will have wins that few other bubble teams will be able to match. They'll need to win five of their next six (five regular season plus one in the Big Ten Tournament) to feel comfortable on Selection Sunday, though. North Dakota St. (7%) - Like Toledo and Southern Miss, only with an upside about 5 spots below Southern Miss. Maryland (5%) - The Terrapins are here because with home games remaining against Syracuse and Virginia they still have the opportunity to impress the committee with one or two signature wins. If they can win at least 3 of their remaining four games the Terps will have a compelling case for Dayton. Georgetown (5%) - Like Maryland, Georgetown has the opportunity to salvage its season in the final three weeks. The path to the Tournament for the Hoyas is clear, but difficult: beat Xavier, win at Marquette, and then beat either Creighton in the Phone Booth or win at Villanova. LSU (5%) - The Tigers have games remaining at Kentucky and at Florida. They must win one of those games, and win all three of their other games: Texas A&M at home, at Vanderbilt, and Georgia at home. Clemson (4%) - Clemson already has a signature win over Duke under its belt, but the Tigers must win at least five of their next six games (five regular season plus one in Greensboro) to have a chance to Dance.